“When do you think we’ll see the signs?” I asked Bryon. The ubiquitous yellow sign with black lettering proclaimed, “Stetson hats for $6.98” with the black silhouette of a bucking bronco, and the name of the business — F.M. Light and Sons. Every drive up Highway 40 to Steamboat, we’ve seen the signs. There had to be at least 30 or more, all promoting the store selling western goods. They stand out on this desolate stretch of road between Kremmling and Steamboat. With nothing else to see except wide open plains and an occasional herd of elk, they’d cornered the market on advertising. Curious about this establishment as well as their “historic” signs, Bryon and I stopped by on a recent trip to Steamboat. Located right on the main drag, Lincoln Avenue, it wasn’t difficult to find. As soon as I walked in the door, I felt I’d stepped back in time. Men in stetson hats and faded jeans stood at the ready to help us out. One entire wall displayed an array of cowboy boots — some the typical brown leather, some made of ostrich and ornately studded with beads. As advertised, they also had a diverse selection of cowboy hats and blue jeans. But more than looking at the merchandise, I enjoyed looking at the historic photos dating back to the 1920s. Some showed a small narrow store with Model Ts parked outside the door. The merchandise was displayed much more formally, everything neatly folded into small cubes along the wall. I asked an employee about the signs. I’d been so curious for so long and wanted to know more about their history. In this era of Amazon, I find it impressive to think they have survived. I found out later that it is quite the feat to keep up those signs. That they have to send out painters once a year to re-paint the signs. Because it’s too hard to repaint the yellow background around the lettering, they paint the whole sign yellow first, then re-do the lettering and of course the bucking bronco. 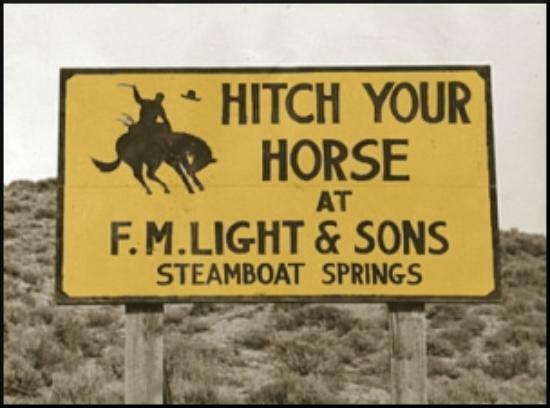 If you’re up in Steamboat and haven’t stopped in to FM Light and Sons, it’s worth a visit, for the merchandise, but also for the history.